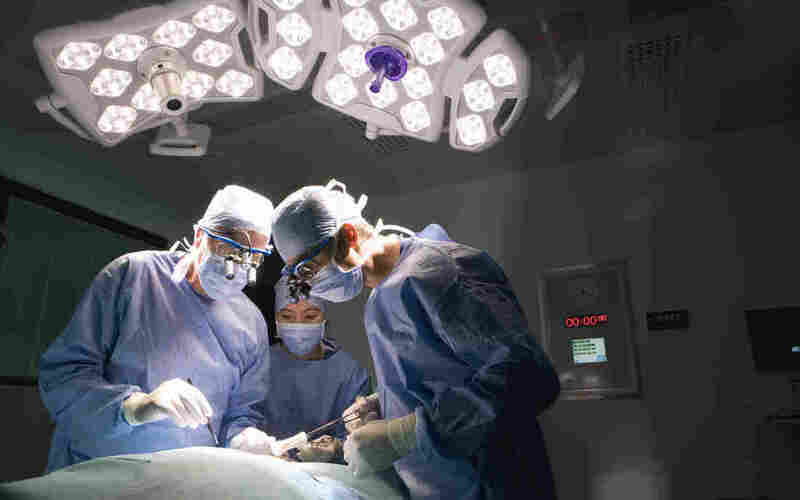 'Overlapping' Surgeries Safe For Most Patients, But Not All : Shots - Health News Most patients do fine, research suggests, when the lead surgeon steps away to begin another procedure. But patients who are older or have underlying medical conditions sometimes fare worse. The common practice of double-booking a lead surgeon's time and letting junior physicians supervise and complete some parts of a surgery is safe for most patients, a study of more than 60,000 operations finds. But there may be a small added risk for a subset of patients. Surgeons are known for their busy schedules — so busy that they don't just book surgeries back to back. Sometimes they'll double-book, so one operation overlaps the next. A lead surgeon will perform the key elements, then move to the next room — leaving other, often junior, surgeons to finish up the first procedure. A large study published Tuesday in JAMA suggests that this practice of overlapping surgeries is safe for most patients, with those undergoing overlapping surgeries faring the same as those who are the sole object of their surgeon's attention. But the study also identified a subset of vulnerable patients who might be bad candidates. The practice of double-booking the lead surgeon's time seemed to put these patients at significantly higher risk of post-op complications, such as infections, pneumonia, heart attack or death. Researchers say Tuesday's study by a multidisciplinary research team from several universities is the most comprehensive analysis of the practice to date, delving into the outcomes of more than 60,000 knee, hip, spine, brain or heart surgeries among patients ages 18 to 90 at eight medical centers. The study compared the outcomes of procedures done in isolation with those that were scheduled to overlap by an hour or more. Dr. Anupam Jena, a physician and health economist on the faculty of Harvard Medical School and senior author of the study, says his research team found overlapping surgeries to be "generally safe." Overlapping surgeries were not significantly associated with difference in rates of death or post-op complications. These findings, says Jena, are in line with all but one of several such studies conducted since 2015, when an investigative team at the Boston Globe first turned searing attention on Harvard's Massachusetts General Hospital. There, at one of the nation's premier teaching hospitals, reporters highlighted a practice that at that point was little-studied and not widely discussed outside hospitals. In extreme cases, the surgeries were essentially concurrent, with the multitasking lead surgeon moving back and forth between ORs. Within a year, the Senate Finance Committee jumped in with a report detailing lawmakers' safety concerns about the practice. And the American College of Surgeons updated its guidelines, adding that juggling "critical" parts of a surgery was "inappropriate." However, the less extreme practice of letting the beginning and end of surgeries overlap is still viewed by hospitals as an efficient means of deploying the skillful hands of their top surgeons. Mass General, which has continued the practice, is in the company of teaching hospitals nationwide. Overlapping surgeries in this way "offers greater and more timely access to certain surgical specialties," Mass General says in an FAQ on the topic, "many of them high-demand, high-volume elective procedures." Jena says this is the first study to show that certain types of patients might particularly be at risk. "This is the only [study] that breaks out and finds in certain high-risk groups we might have worse outcomes"— namely, in older patients, those with pre-existing medical conditions, and those undergoing coronary artery bypass graft surgery, where blood flow is restored to the heart. When the researchers homed in on these high-risk patients, they found slightly higher mortality rates among the patients who had undergone overlapping surgeries and were older or had underlying medical conditions — 5.8 percent compared with 4.7 percent for patients who had the lead surgeon's full attention. This discrepancy, says Jena, "could occur because a surgeon is separating their mental effort between two cases or [from] literally being [in] two places at once. Those kinds of problems would have a measurable effect on high-risk patients." The study also found that surgeries booked to overlap lasted a half-hour longer, on average, than those done in isolation. Dr. Robert Harbaugh, former president of the American Association of Neurological Surgeons and current chair of the department of neurosurgery at Penn State's Milton S. Hershey Medical Center, was not involved in the study but says he was not surprised to see the findings show a "modest but real" risk posed to high-risk patients. "In my practice, if I know someone is a very high-risk patient, you're much less likely to [schedule] that patient for an overlapping surgery," says Harbaugh. Surgical patients who have multiple underlying conditions, such as diabetes or hypertension, he says, require his full attention. This study, he says, supports his sense that there is "a specific group of patients that probably has to be monitored more closely." However, Harbaugh says, overlapping surgeries are crucial "to make the operating room run more efficiently." Surgeons are fully booked two or three months in advance in his department at Penn State, he says. Allowing four surgeries a day lets patients be treated that much sooner — as well as providing "the next generation of surgeons" much needed training time. The leading surgeon is always scrubbed-in for the "dangerous part of the surgery," Harbaugh notes, and only leaves the patient with residents who are "competent to open or close a case." "If you're finishing an operation and you tell your resident, 'You can go ahead and close the incision,' they're more than competent enough to do that," he says. "Then you leave, go to another room where a [surgical] fellow has started a case. That's an efficient use of time." Harbaugh estimates 15 percent of the surgeries done by doctors in his department overlap. Harbaugh also notes that his surgical department at Penn State requires surgeons to explain to patients when they sign the consent form that that they will be stepping out for parts of the surgery. But he doubts that policy of transparency is universal, he says. Jena says there is "little information about what patients know" when it comes to the practice of overlapping surgeries. A 2017 study found few people had ever heard of the practice. He says he and the study's lead author, Dr. Eric Sun, an anesthesiologist and assistant professor at Stanford University, "both would agree that doctors should be telling patients about this practice." Jena recommends patients ask, ahead of the operation, whether their surgeon will be dividing time. If they don't like the answer, Jena says, "At any point, the patient could say, 'I don't want care provided to me.' "
Diana Zuckerman, a policy analyst and president of the National Center for Health Research, is doubtful many such conversations are likely to occur. "Most patients wouldn't know to ask," she says. "The good news is, for an an individual patient, they shouldn't worry," Zuckerman says, pointing to the fact that the study found no significant increase in post-op problems or deaths overall. However, she says, questions linger over whether patients should be informed about a surgeon's other commitments, even if the risks of complications are low. "I think it's safe to say if patients were told, nobody would like it," Zuckerman says. "Nobody wants to feel like the doctor is going in and out of their surgery."